From the stones of Jerusalem to the waves of Tel Aviv Mediterranean beaches, Israel has cradled the history of many faiths since the beginning of time. The Holy Land of Israel is sacred to Jews, Christians and Muslims. This is where the ancient history and the ancient religious texts come vividly to life, and few other places in the world offer so much to sustain the spirit, feed the intellect and stimulate the senses. Located where three continents, Africa, Asia and Europe meet, Israel is intense. Within its comparatively small territory, it reveals abundant riches, from cherished religious sites to well-preserved archaeological treasures and spectacular natural wonders. Not only the ancient Jerusalem, the Roman, Crusader, Greek, and Byzantine monuments, but also the youthful and dynamic Tel Aviv, the ultra saline Dead Sea, cool mountain waterfalls, gentle, vineyards covered hills and sweeping desert landscapes. The country's ethnic, religious and cultural mix is endlessly fascinating, and the people of Israel are warm, hospitable and passionate, representing a fascinating mixture of conflict and harmony, passion and serenity. This is the Promised Land to which Moses led the Children of Israel. This is where Abraham forged his covenant with God, Christ preached his sermons and Mohammed ascended to heaven. During our exploration of Israel, we'll experience its parallel universes, where cultures, ethnicities and religions intersect, coexist and influence each other and where 5000 years of human history converge. We'll start in Jerusalem, where we'll explore the Old City and get immersed in layers of its history: the Western Wall, the Church of the Holy Sepulcher and the Dome of the Rock, then we'll travel to the imposing Herod's fortress in Masada en route to the Dead Sea, where we can float in the salty waters, before indulging in a mineral-rich spa experience. 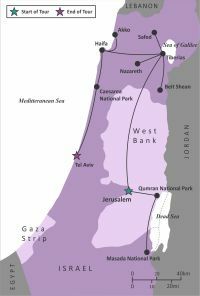 We'll continue north to Tiberias on the Sea of Galilee, deeply rooted in the Christian tradition, where we'll tour the Christian and Jewish sites of the region: Nazareth, Capernaum, Safed, Haifa, Akko, Caesareum. We'll visit a Druze religious community and learn about their life, as we prepare lunch with the Druze women. We'll tour an Israeli boutique winery to learn about their wine making process and taste their award winning wines. We'll end the tour in the vibrant and modern Tel Aviv on the Mediterranean with its beautiful beaches and cultural vivacity, Bauhaus architecture, seaside promenades, first-class restaurants and great shopping. While staying in Jerusalem, we'll spend three full days exploring the city with its famous sites of the Western Wall, the Church of the Holy Sepulcher and the Dome of the Rock, along with the Mount of Olives, Yad Vashem, the Shrine of the Book, and the New Israel Museum, and many other Christian and Jewish sites. We'll enjoy a Sabbath dinner with a local family and the Night Spectacular Sound and Light Show at the Tower of David Museum. We'll also meet with a renowned Israeli screenwriter for a presentation on Israel's society through its cinema. We'll travel to the Dead Sea, the lowest place on Earth to experience this natural phenomenon, followed by a luxury spa experience. En route, we'll stop at King Harod's mountaintop fortress of Masada, and pass by the caves of the Qumran National Park, where the Dead Sea Scrolls were found. While staying in Tiberias, on the Sea of Galilee, we'll tour Nazareth and the Church of the Annunciation, Capernaum, the site of a fantastic 5th century synagogue, and the base for Jesus's Galilean ministry on the Sea of Galilee, the Mount of Beatitudes, the charming town of Safed, the center of Kabbalah, the Jewish mysticism, Haifa's Shrine of the Bab with its hanging gardens, Crusader's city of Akko and Herod's Caesarea. We'll join a culinary workshop in a Druze community and tour an Israeli boutique winery. We'll end the tour with a full day exploring the Mediterranean Tel Aviv, where we'll see not only the ancient town of Jaffa, but also the city's Bauhaus architecture and the modern sections of the city with their world-class restaurants and shopping.